In so many ways, the TEACHED film project is about the importance of teachers: the crucial role they play in the lives and futures of our children at the individual level and, when you zoom out, the role they play in the nation as a whole in maintaining and imparting the values and dreams of our democracy and beautiful melting-pot of our citizenry. Think this is overstating it? For some perspective, there are more than 3 million public school teachers serving our children and youth today. This is more than TWICE the number of active military personnel in all the U.S. armed forces combined (1.4m)! Looked at this way, teachers represent an "army" of citizens who have taken on the responsibility of protecting the American Dream and our shared values of equality and justice via knowledge. From the inside out! Lofty words for a Thursday morning, but sometimes given today's heated debates around the how/why/who/what of teachers in America, we might need a reminder of what an important job this is -- the power and responsibility that teachers have! We believe it should be a difficult job to get and keep, and it should be compensated and honored as such. For National Teachers Appreciation Week, some of us here at TEACHED wanted to share our thoughts about the teachers who impacted our lives the most. Feel free to add your own teacher-appreciation-story below! My life would be completely different had it not been for the influence of Joel Plummer, a teacher at Plainfield High School in New Jersey. Mr. Plummer was my U.S. History I teacher, my African American History teacher, and my basketball coach. Inside the classroom, I will never forget how he instilled in me a sense of confidence and pride about my culture. He was adamant that his students, nearly all of whom were African American and Hispanic, understood their heritage and past and were able to think critically about racial and social issues. However, my bond with Mr. Plummer grew much deeper. He became my mentor, and I looked to his advice on everything from family issues, work issues, and relationships. Neither of my parents, or any of my siblings, made the choice to attend college. I was determined that I would be the first in my family to do so, but was quickly overwhelmed by the process. Mr. Plummer was instrumental during this time, helping me look at schools, editing my admissions essays, and helping me apply for financial aid. Without his guidance, I would not have been able to attend New York University. Mr. Plummer has inspired a lot of students at Plainfield High School, but the effect he’s had on my life has been immeasurable. Today, more than 7 years since I’ve left his classroom, I still call him at least weekly to chat, catch up, or ask advice. I cannot let Teacher Appreciation Week pass without honoring the man who has impacted my life so greatly. My outlook on writing and my education in general was certainly enriched by my professor George Evans. Professor Evans frequently introduced me to the beauty of writing and sharing ideas, developing a voice and respecting the right and ability to write whatever we want for everyone to read and, as a result, respecting and cherishing our literacy. Prof. Evans always encouraged us to write in a way that we would be proud of seeing published. Keeping that idea in the back of your mind changed the way I wrote everything. Prof. Evans is with the times, encouraging us to blog our ideas and read other blogs, and understand that our right to a lack of internet censorship should not be taken for granted (we may have to fight for it someday!) Anyone anywhere in the world can now post pictures, videos, and ideas from anywhere exposing the truth and documenting the whole truth. Evans encouraged us to read broader news and be aware; staying away from too much partisan news like CNN and FOX and consider other large scale news like Al Jazeera and BBC. Awareness and the ability to share go hand in hand, so thank you George Evans for not only being an excellent writing professor who never wasted a minute of class but also for putting my university experience into a different perspective with new feelings of anger, frustration, appreciation and curiosity. Today is a very special day: I'm taking my 6th grade teacher, Mr. Martin, to lunch. I have not seen him since I was in junior high in a small town in Nebraska, so I am really looking forward to telling him in person what an impact he made. The timing of National Teacher Appreciation Week makes this even more special. Mr. Martin was one of those teachers who was so clearly and perfectly made for the job. He was smart, entertaining, fair, hard-working and fun. I remember many of the lessons he taught distinctly, mostly in science because he made it come alive (sometimes, almost literally: we dissected quite a few critters that year). I appreciate so much that Mr. Martin pushed me to my limits in math. Especially realizing now how rare that was (and sometimes still is, sadly) for girls to be pushed to achieve in math, I credit Mr. Martin with the fact that I ultimately reached AP Advanced Calculus in high school (yes I'm bragging a bit - that was probably my greatest accomplishment in high school)! It also helped me to believe I could and can do anything I put my mind to, even in areas traditionally dominated by men. Living in a small town with one elementary and one jr-sr high meant that everyone pretty much knew everyone, especially all the teachers. They weren't just part of the community -- they WERE the community. They were our heroes and they were like family. When I became an elementary school teacher, I looked back to my own-- at the top of the list was Mr. Martin--to try and be as good as they were. Thank you Mr. Martin - I know I speak for MANY others when I say, you are an exceptional teacher and we love you! Posted on May 8, 2014 by Loudspeaker Films and filed under by Kelly Amis, TEACHED Interns. - Reading The New Jim Crow by Michelle Alexander. - Watching 12 Years a Slave, notice how one of the slave owners' greatest fears is their slaves learning how to read and write. - Watching videos on our Youtube page, TEACHEDTV. 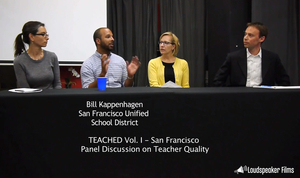 - Organizing a screening of TEACHED Vol. I to bring more people into the conversation. Go to our Screenings Page. We will help you organize a meaningful event. - Checking out the organizations we've listed on our Take Action Page. These are just a few of the best organizations working for education equality today. - VOTE for and support candidates for public office who will demand change in our education and judicial systems. Posted on February 5, 2014 by Loudspeaker Films and filed under Media Coverage, by Kelly Amis. Posted on January 28, 2014 by Loudspeaker Films and filed under Screenings, by Kelly Amis.